I’m thrilled to have my artwork appear on Seven Impossible Things, which I’ve long considered one of my go-to sites for children’s books. 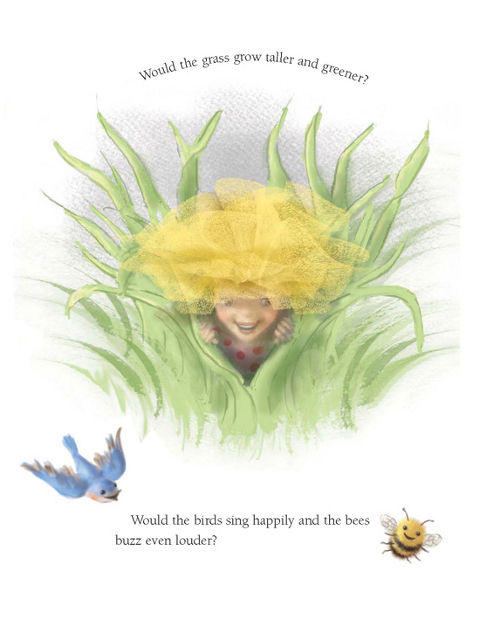 The pictures here include some illustrations, endpapers, and sketches from The Yellow Tutu, my first foray into illustrating books. 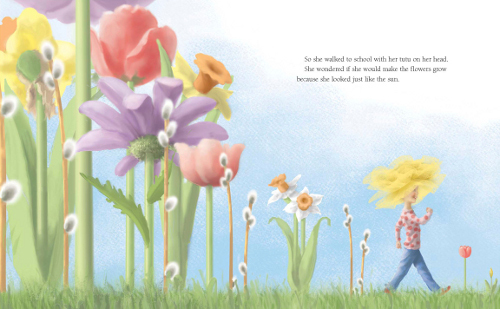 My sister, Kirsten Bramsen, wrote the wonderful story, based loosely on her having once gone to school with a tutu on her head. I painted the whole book in Photoshop — with a digital tablet. I had intended to use watercolor, but one day I happened to scribble down the rough sketch of Margo holding up the tutu. Oops. That little sketch collared me and would not let me go. For me, it conjured the image of Margo, splashing, part-submerged, in tulle. It forced me on a wild-goose chase through art supplies for something that might allow me to show Margo smiling through tulle — something that might convey a birthday tutu in all its visceral abundance. Agony ensued. But let’s get right to the ecstasy: I was learning at that time that Photoshop lets you make something like a stencil out of almost anything—a line, a texture—no matter how fine. 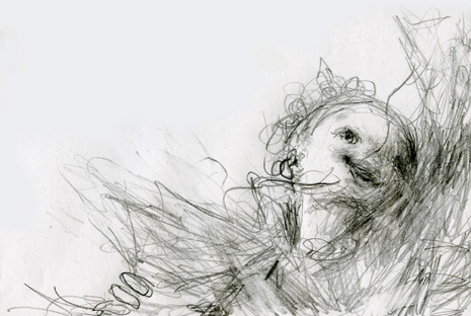 So, I thought, “Aha!” I rubbed some black conte crayon on rough paper and scanned it into Photoshop. Then I turned that into a stencil/masque and painted through it digitally with yellow. 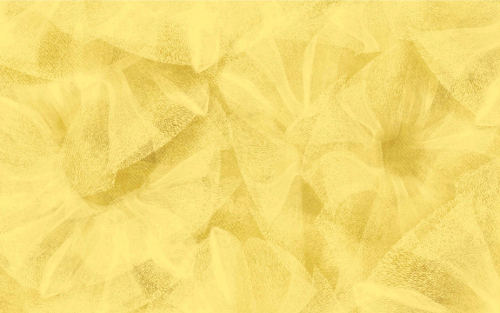 And there it was, like a scrap of real-life tulle: one square layer of semi-transparent yellow texture. That became the building block, cloned and tinkered with ad nauseum, for the tutus that appear in the book. There was nothing the least bit elegant about my method — a kludge, if there ever was one. But, once you hit “flatten image,” no one can see the mess. (Still, always save a layered copy!). I’m happy to be working with Random House again on my new book, Hey, Duck!, which is due out in 2013. 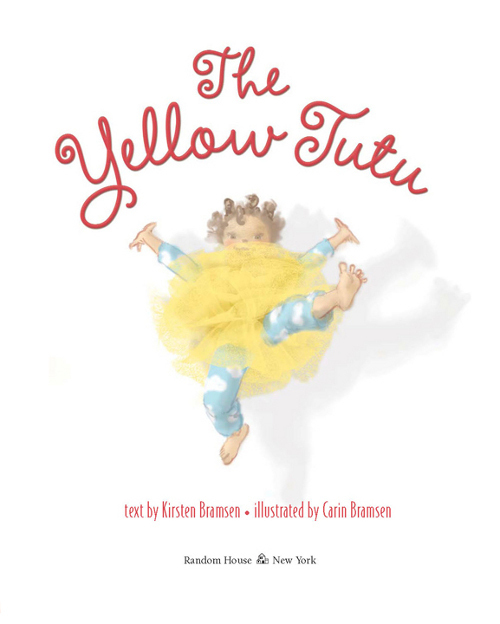 THE YELLOW TUTU. Copyright 2009 by Kirsten Bramsen. 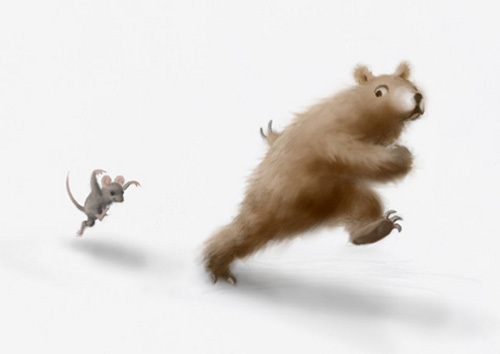 Illustration © 2009 by Carin Bramsen. Published by Random House, New York, NY. Well, first and foremost, y’all: EGYPT. The birth of a new nation. Wow, just wow. 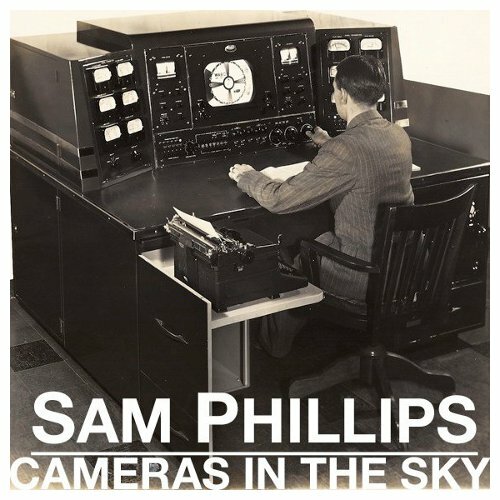 Also—and here I’m clearly zooming back to a way more personal, less world-events kind of a kick—Sam Phillips released her full-length CD this week, Cameras in the Sky, what she had promised those of us who signed up for her year-long, art-and-music-installation-on-the-web project (called the Long Play). We got little EPs, that is, all year, and the whole thing was to culminate in a full LP. We fans have known for a while now that it was to-come soon—as we’re nearing the end of the Long Play, sadly—and I was super happy to see it arrive this week. Yesterday, to be precise. (I wasn’t obsessively checking her site every five minutes or anything for weeks on end, no sirree.) When I saw the music was there, I believe I jumped up, did a fist pump, did a little square dance with myself, and quite possibly high-fived and fist-bumped my own self. Other than grand news like that (Egypt and Sam, though I know that Egypt is way bigger, even given the serious Sam fan that I am), this wasn’t my best week. I fought some Icky Something or Other all week. (Flu? Particularly dastardly cold? Pesky ennui? Unfortunate lack of grace on my part? All of the above?) It left me with no get-up-and-go, and I’m no good without my get-up-and-go — particularly as I face what is, for me, a huge writing deadline, which already leaves me all bitey on my fingernails. I’m ready to start anew this week, and I’m really ready for some sunshine. A healthy does of Margo’s selfshine wouldn’t hurt either. I leave you this morning with two songs. I have no flippin’ clue who this singer is, other than reading she’s a Montreal-based musician named Laurel Sprengelmeyer, who goes by Little Scream. But I stumbled upon this video of her and some lovely song she wrote, called “The Heron and the Fox,” a song of affection and loss and other Big Stuff. She filmed it in the back of a snow-covered station wagon, and I like it, not to mention singing so that you can see her breath on the cold air is fitting for such a stark song as this one. Also, because Nicole Atkins released her new CD this week, I leave you with her. At this link is her live (in the studios of Rolling Stone, that is) cover of Roy Orbison’s “Crying.” (Sorry about the ad at the beginning.) Conor O’Brien (of Villagers), whose music I love, once wrote about Orbison’s “Crying”: “Voice, chords, melody, arrangement, production, yes. Thank you, sir.” It’s pretty much perfect, and Nicole Atkins is one of the very few folks in this world I’d want to hear covering it. Do you know I once read at The Guardian that Roy Orbison wrote the song after he saw an ex-girlfriend at a burger stand? Random fun fact. P.S. The February issue of The Bluegrass Special is online, and it’s good stuff. And I don’t just say that ’cause the terrifically nice editor puts a bit of 7-Imp in it monthly. Let’s hear it for Selfshine! Love, love, love the illustrations! Jules, we all need yellow, blue, dancing, flowers, and squirrels with pointy shades and lemonade this time of year. Thank you and the Bramsen sisters for that. Hope you feel more kicking soon. Maybe the deadline is the cause as well as obstacle? Such happens. 1. Valentine’s Day brunch with husband and four good friends today. 2. Secret plan to make heart shaped pumpkin cranberry muffins tomorrow morning. 3. Three or four days without snow counts this year in Mass. 4. Exciting plan to meet blogging friend from west coast in real life this week, when she visits New England. 5. Bones are down in my manuscript, and now I get to play among them. Which sounds creepy. But plot laid doesn’t sound fun. Hmm. 7. and essays. Love The Left-Handed Story. So glad to hear you’re feeling better. Thanks for all the sunshine-y yellow! 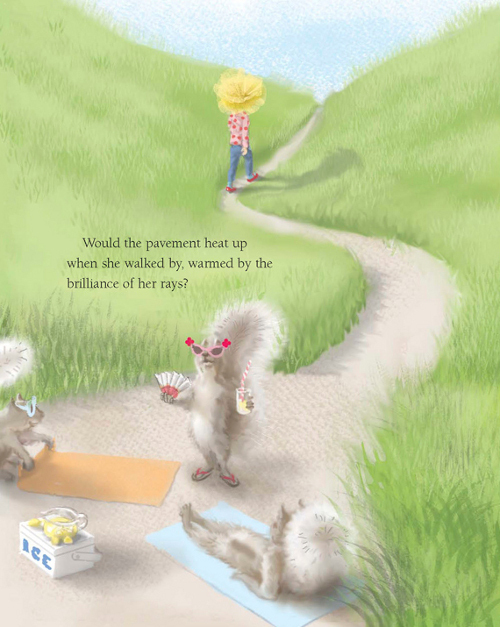 I especially like that first spread — it personifies “kicks,” and the one where she’s walking along the sidewalk. I love the confidence about the brilliance of one’s rays :). It’s always fun to hear you going on about your Sam-love — square dancing and fist pumpin’ yourself. Jeannine, love your secret plan to make cranberry muffins tomorrow morning. Hope you have a lovely brunch today! Thoroughly enjoyed working with the other Cybils Poetry judges this year. We have a winner!! Doc Martin on PBS. If you haven’t yet watched this series, you must. 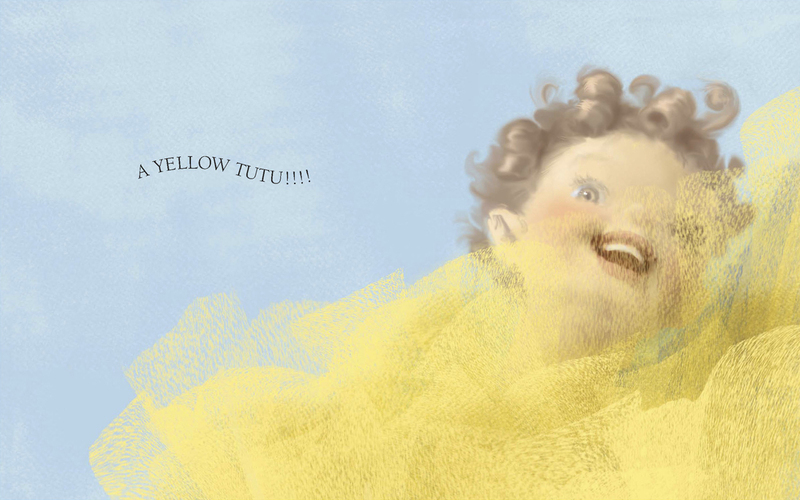 Oh, my, thank you for introducing me to The Yellow Tutu! Somehow I have missed that book and really must get it for my 30-year-old daughter as we loved her early elementary years dance recital costume that appeared to be in part a red tutu they wore on their heads. I have that photo in my office to make me smile! National Jello Week: red, plain ordinary red. Comfort food! *The water damage in our office is fixed in time for the Board meeting this coming week! *CYBILS come out tomorrow, can’t wait! Bursting to tell about Nonfiction Picture Book winner. *Found the Retro Fisher Price Music Box Record Player in stock that I want for William’s 2nd birthday. Alas there are not two more as it was a downer Friday night to receive the latest budget bill from the House and note the new leadership has left RIF out of budget for FY11 (yes, the current year’s spending plan is still not finished)…here we go again. And tomorrow we believe the President will leave RIF out of FY12 budget in his massive budget cuts…and again here we go. 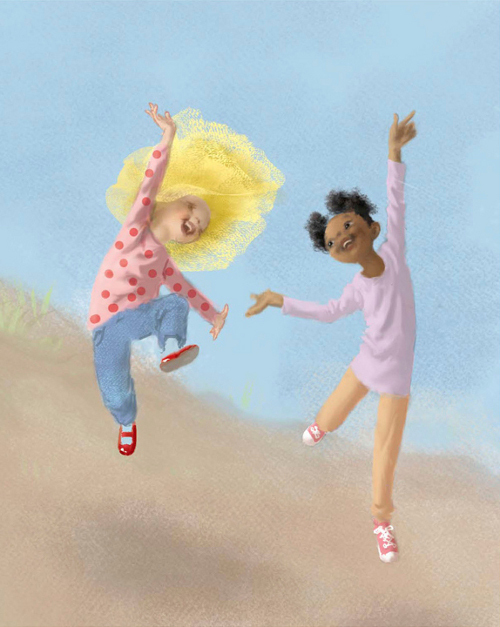 But we’ll march forward and I will have a red tutu on the head clad daughter and this great selfshine book by it and they will bring smiles to my face! I love the Yellow Tu-tu! I can’t believe it’s not watercolor. The story is so much fun. Jules, I hope you get sun this week or carry a yellow tu-tu with you. Jeannine, have fun meeting a blogging friend. It’s so fun to do that. Jama, my favorite jello is dark cherry. Now I will have to make some. 1. Such good news in Egypt. Author, Bruce Coville, was stuck there but returned safe. 2. Tomorrow is my 19th wedding anniversary. 3. Student poems about colonial America on my Poetry Friday post. 5. LW on 90210 last Monday. 6. Discovered a new restaurant by our house. Lovely Friday night music and great Mexican/Peruvian food. Carol, I’ll be rooting for you this week. AND duh, how could I forget, the CYBILS Announcement tomorrow. Am so excitied! Hi, everyone. Thanks for visiting. I’ll be back later-later. I have to say quickly, though: Carol, I’m so so so sorry to hear that about funding. Let us know how we can all help. Jules – so sorry you’ve been sick, but hope its on its way out and that you are speeding towards a full recovery – with get up and go restored! Jeannine – brunch on Sunday and muffins on Monday sounds wonderful. Jama – congrats on surviving the in-laws visit. National jello week? Must.Get. Jello. Jone – Happy anniversary and congratulations too! Yellow crocuses make me smile. 2) Crisp cold sunshine on Wednesday and Thursday. Thank goodness we have days like that – they get me through the long stretches of grey and rainy. 3) Gave away an awesome LBD from my younger L.A. days to a younger friend – my days of super short and tight dresses are behind me – and seeing her face when she saw how great she looked in it made me very happy. 4) Beginning to learn how to really close a door. 5) Rereading old journals to remind myself how far I’ve traveled and how much I’ve accomplished. 6) Good friends you can call any time for a reality check. 7) Ingrid, a 10 year old Rottweiler that I seem to have adopted from animal control this week. Don’t really know what got into me, but I saw her sweet face on the website and was so worried no one would take her home because of her age that I went to meet her and that was it. No pics on my site yet, but soon. Happy Valentine’s day and have a wonderful week! 8) Seeing LW on 90210! Woot woot! Go LW! You were great, and really rocked those super cute glasses! Congrats! Happy Anniversary, Jone! And thanks for reminding me about dark cherry — yeah, love that :). Disappointed that I missed LW on 90210! Linda, yes. Selfshine is a good shine. Jeannine, I don’t think the bones sound creepy at all. And congrats on such good reading, as well as secret baking. Enjoy your blogger meet-up. Do you know how many of you bloggers and authors and illustrators I’d like to meet in person? A whole heapin’ ton. I’m excited for you. … Oh, and yes, I definitely have dread about my writing deadline, but it was also definitely a definite germy thing I had, too. Some kind of weird flu? I dunno. I’m glad it’s almost gone, though. Jama, yes, that first image does personify the kicks, doesn’t it? I hadn’t thought of that. I love love love the image of Margo with tears in her eyes. She KNOWS she’s more awesome than a double rainbow (or squirrels with shades), but someone has tried to break her. However, I just couldn’t bring myself to open a kicks post with a sad image. The one of Margo and Pearl busting a groove is very kicky, indeed. …Congrats on surviving the in-law visit, as well as all your Cybils work. Will you still speak to me if I say I’ve never really been a big fan of jello and don’t even know what my favorite flavor is? Maybe I’ve never had good jello? Lemon does sound good, indeed. Never had lemon. Carol, I’m so sorry to hear again about the lack of funding. Let us know how we can help, if and when the time comes. Hope your daughter likes the book. Jone, happy anniversary in advance! And you’ve already seen crocuses? Score! I give seven cheers to more daylight, too. I totally forgot that one of my kicks was seeing Little Willow, too, on 90210. I missed it as it aired, but I saw it later. Jules, the LBD is what you think it is, a Little Black Dress. Yeah, #4 has always been tough for me, but think I’m finally getting it. And yes, adopted-adopted Ingrid, as in, brought home, follows me around now, and is right now resting with her head on the dog bed while looking at me. We just got back from her first vet visit, healthy so far, we’ll get test results later this week. She seems to be adjusting ok, is super-sweet, lots of kisses, walks well on the leash, but needs to lose a few pounds. At the shelter she weighed in at 113, today she weighed 107, vet thinks 100 would be a good target weight for her. She’s built like a tank. And she’s got those devoted rottie eyes. I think we’re mutually smitten. Love those illustrations! Margo’s eyes are so alive and expressive, and the process of getting the tutu’s texture is fascinating – it turned out so layered and lifelike. 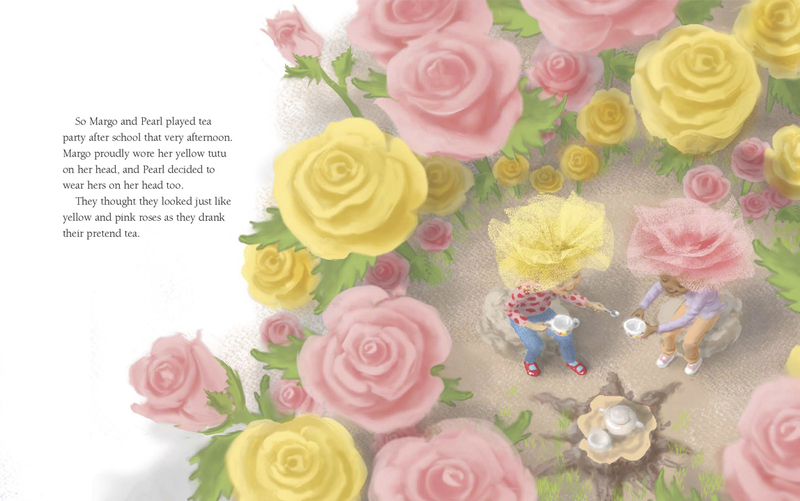 Thanks for posting these springy images. 1/ Valentine’s Day cupcake-baking with kiddos and watching them lick the beater and spatula very thoroughly and quietly. 2/ Sun being out today! 3/ Working hard and getting things done. 5/ Dancing to “Vogue” with kids and watching them bust a move. 6/ Watching 7yo score a basket at his game and hi-five his friends. 7/ Going to a great Midsouth SCBWI talk on character development and birth order by lovely author friend, Rae Ann Parker. So glad you’re feeling better. Bring on the spring! http://www.democracynow.org/2011/2/8/asmaa_mahfouz_the_youtube_video_that Wow. That girl is bravery incarnate. Makes me tear up. 2. 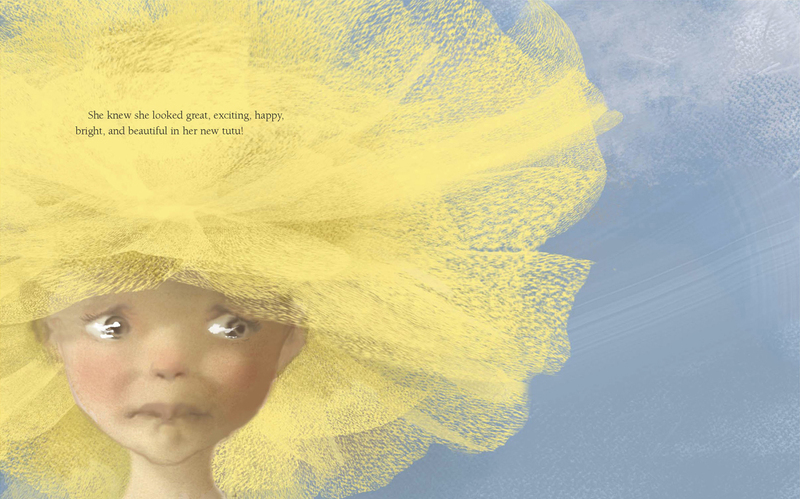 Speaking of tearing up – the image above of tutu-head Margo with her glistening eyes and puckered lip just floored me. 3. Catching up my wall calendar (which is a running combo of notes, apptmts, paste-up collage of news and art.) Now it’s full AND colorful. 4.My mom and her sister reminisced: riding the ‘red cars’ in old LA, listening to their grandmother speaking Gaelic, the incident of ‘Mr. Babcock and the stolen penny candy’ (!) that haunts them to this day. 5. Went to a thematic party for grown-ups (which is rare; I like ‘idea parties’.) Valentine’s Night for couples: wear a bit of red, dine on pink salmon and chocolate dipped strawberries, hear two opera singers! Happy Valentine’s Day to all of you and your sweeties. Very kicky images and story this morning. I’m feeling the joie-de-tutu. 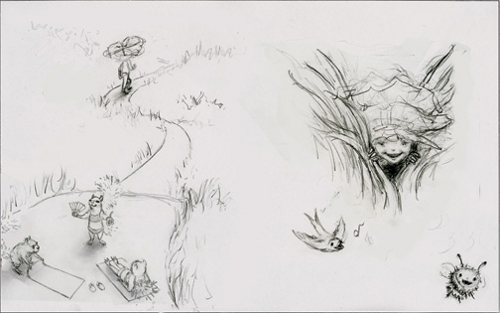 And the little sketch that collared Carin Bramsen is wonderful too. Jules – though you’re feeling under-the-weather your blogging enthusiasm shines through. Good luck with your stressful deadlines. The Little Scream vid with the pan around the snowbound car – from CU finger strumming to Atkins to harmonist and percussionist in the front seat was very intimate and very cool. Thanks for sharing. Jeannine – manuscript bones. great image. congrats. jama – pondering poetry; look forward to reading your winner. my jello pick: lime with sour cream whipped in; a tartly sweet cloud. Rasco – photo with red dancing tutus. And plain red jello. jone – happy anniversary! I’m intrigued by your Peruvian food find. I missed KICKS last week (as I drove my mom to visit with her sister in Apple Valley,) so my list (above, sigh) are for the last two weeks. Jessica, so glad you enjoyed the SCBWI talk, and I’m with you on the return of the sun. Denise, thanks for the linkage. I look forward to exploring it. I don’t know where to begin with your kicks. That’s a rich week is what that was — or couple of weeks. CUPCAKE STORE, good party, listening to family stories, and I want to see your wall calendar! Take a pic for us, if you’re so inclined. 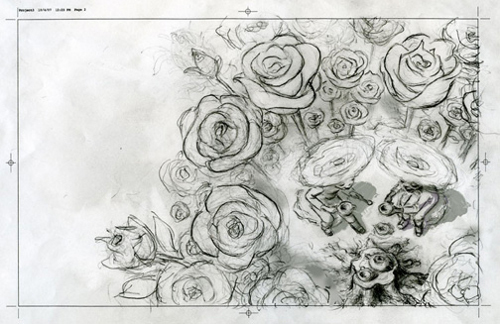 (Sounds like Jack Gantos’s journals, all filled with clippings and drawings and images and such.) As I’ve already mentioned, I love that image of Margo tearing up, too. Carin nails it. Rachel, almost missed your comment. Ingrid sounds wonderful. Here’s to her health. Right. So, I planned ALL DAY to stop in for kicks. Planning is not enough. Here’s my one big personal kick: I’m preparing for Seattle’s The Big Climb on March 20. It’s 1311 stairs up a 788 foot tall building, and the money raised by sponsorship benefits the Leukemia and Lymphoma Society. Little Willow, glad you had a good week, though I think you even make the most of the bad ones. Farida, wow. How does one prepare? Sounds great. I’m ready to see some crocuses, too. Hi there, Carin, and hooray for tutus! Thanks for sharing your art with us. 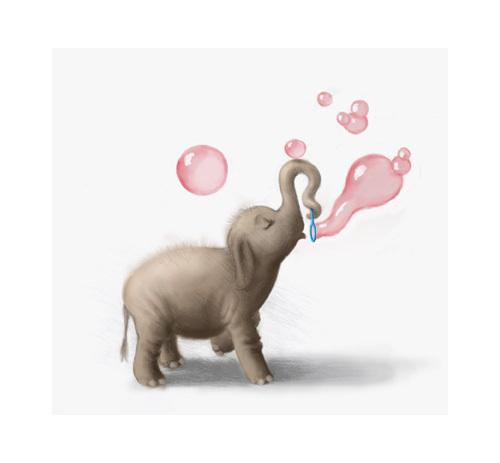 I especially like the image of the elephant blowing bubbles. Loving how you put EGYPT as a kick, Jules. May the nation have new strength and unification. Jules: Hoping you’ve kicked that illness to the curb. No gray skies allowed, metaphoric or otherwise. And yes, I do try to see silver linings. 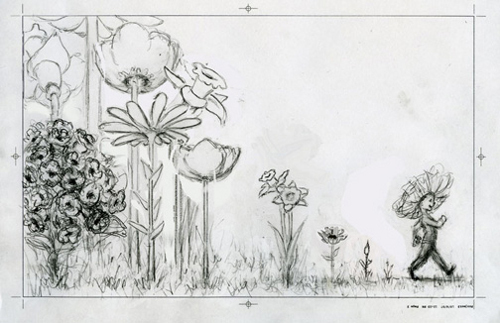 Jeannine: I feel sorry for anyone who hasn’t seen squirrels dance through a field of flowers. How were the muffins? Hope you had fun with that secret treat, and that you have fun meeting up with your friend! jama: As a vegetarian, I can’t eat Jell-O or anything with gelatin in it. I am quite grateful for the companies which produce all-natural gelatin-free yogurt, because I really love yogurt. Rasco from RIF: I know I’m one of many Kickers who is sending support to you and the others involved in RIF. Fingers and toes crossed for your budget. Rachel (rm): See above re: gray skies not allowed – I hope that everything is sunny and clear for you soon. Thank you for adopting Ingrid and saving that sweet rottweiler’s life! I am glad that she is adjusting and is so healthy. Oh my goodness, she outweighs me. The glasses were props. I was amused by the fact that I was wearing contacts and glasses simultaneously. Jone, Rachel (rm), Denise Doyen, and jules: Thanks for watching, and for including the zip code show in your kicks! Jessica Young: Now I’m singing Vogue! How fun that must have been to share with munchkins. Kudos for hard work and accomplishments. I’m all about getting things done, too. Denise Doyen: Whenever anyone mentions penny candy, I think of All-of-a-Kind Family. I love those books. Farida: GO YOU! Wow. Wow. That’s admirable. Be safe. 2) Screen time and credits – I still can’t believe it. 3) Table read for another film – Principal photography begins this week! Little Willow, congrats on the callback! Keep us updated, as always. #4 and #5 sound very exciting, too. Wow. Sainta and Spinners – Wow! How many flights is 1311 stairs? Good luck and have fun! Not spammy at all. Thanks for doing it! Thanks, Jules! The comedy show is expected to air on TV this summer. Rachel: You are welcome, and thanks in return! And again I say: Go, Farida, GO! 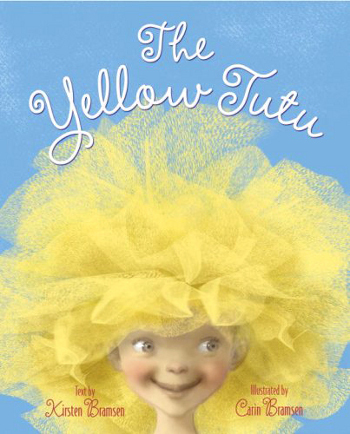 I love the illustrations you posted from “The Yellow Tutu.” Thanks for “revisiting” this book. I must have missed your first post about it. Not much going on in my life these days. Fortunately, all the snowstorms we had around these parts recently helped me to break through my writer’s block and write some new poems. New Elaine-poems = good news for us readers! WOW!!! Today has gray skies — again — and I’m getting ready to go to CO for my Mom’s funeral. But I feel happier just knowing that The Yellow TuTu and selfshine are out there.